The item Justice League, Volume 5, issue 26-31, Legacy, Bryan Hitch, writer ; Fernando Pasarin, penciller ; Oclair Albert, Andy Owens, Batt, Mick Gray, Scott Hanna, inkers ; Brad Anderson, colorist ; Richard Starkings & Comicraft's Jimmy, letterers, (electronic resource) represents a specific, individual, material embodiment of a distinct intellectual or artistic creation found in Kent District Library. The Justice League is dead...or worse. It's 22 years in the future, and Earth is a wasteland, crushed under the heel of a dread goddess known only as Sovereign. But the world's greatest heroes have left one thing behind that can save the world. Their legacy. The children of the Justice League, now heroes in their own time, must travel back in time to stop Sovereign before she kills their parents and seizes power. As the original Leaguers process the shock of meeting grown sons and daughters they didn't know they'd have (in some cases with their teammates), their offspring search for clues to Sovereign's rise. But when it seems like one of the Justice League is fated to become Sovereign, will the team battle their own flesh and blood? 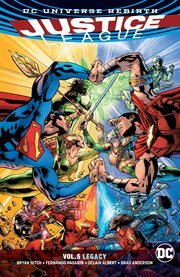 Writer Bryan Hitch (The Authority) and artist Fernando Pasarin (Green Lantern Corps) introduce the next generation of heroes in these tales from Justice League!